One of the spectacular vistas at Big Bend National Park. Image courtesy United States Geological Service. Camping Fee Additional, usually $12 (backcountry) to $14 (developed) per night. Summer - This is south Texas, just across the border from Mexico. Expect very hot. Extreme care must be taken to have plenty of water, sunscreen, and other provisions for hiking, camping, or visiting the desert. Care should also be taken at other times of the year for the extremes of cold, which may be rarer, but still should be taken into consideration. Check the weather conditions before you go and prepare for all contingencies. 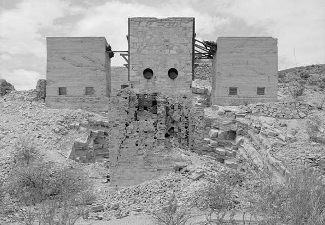 Photo above: Historic view of history, the Mariscal Mines, at Big Bend National Park. Source: Library of Congress. Right: A mountain view at the park. Source: USGS. 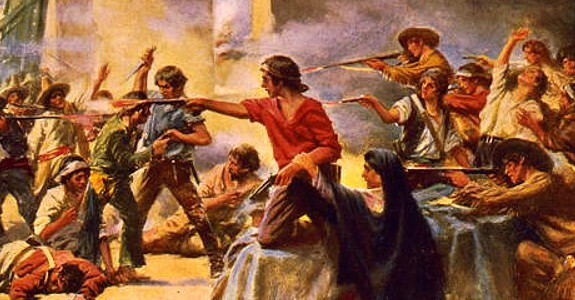 When we think about Texas history, the first historic sites that come to mind tend to be the missions of San Antonio, particularly that of the Alamo. But the history of Texas, in many ways, is not in the buildings or even the battles that made it, at first, a nation on its own, and then a state. It's in the history of the hard tough land the settlers from all walks inhabited, beginning along the river that defined its southern border, and now, defines this park. Yes, it's the Big Bend of all national parks in the state that defined big, well, at least until Alaska came along. For centuries, the area of the Rio Grande River and now Big Bend National Park has been a fluid place of culture, where Indians roamed and where Mexico and the state of Texas, and now the United States shared a border and culture. In fact, at one time, six nations claimed this land as theirs. But the culture reaches back much farther than that, and the archeological finds in the park date back up to ten thousand years. In more recent times, Comanche warriors would cross the land to raid. Today, you can drive along portions of the Comanche trail. Actual settlement by non-Indians is a more recent edition; Mexicans around 1900, Anglo-Americans around 1920. 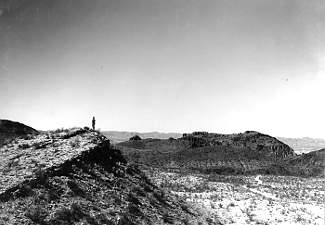 Once the park was established in May 1933 as Texas Canyons State Park, development of the roads, camps, and other amenities was largely achieved through the efforts of the Civilian Conservation Corps during the depression. This corp was established by President Roosevelt as his "Tree Army," paid $30 per month, and sent to many natural sites to construct. From 1934 to 1942, the corp members at what is now Big Bend National Park (established 1944) built the seven mile access road to Chisos Mountains Basin, the Lost Mine Trail, and four cottages, still in use. 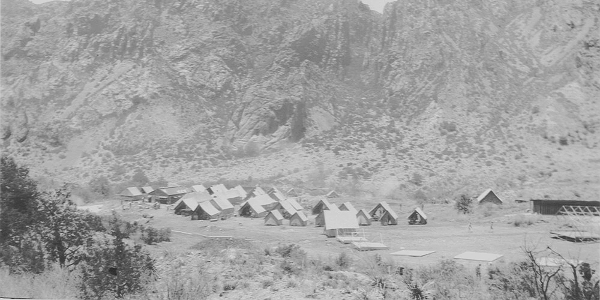 Photo above: Civilian Conservation Corps Camp at Big Bend, 1934. Courtesy National Park Service. 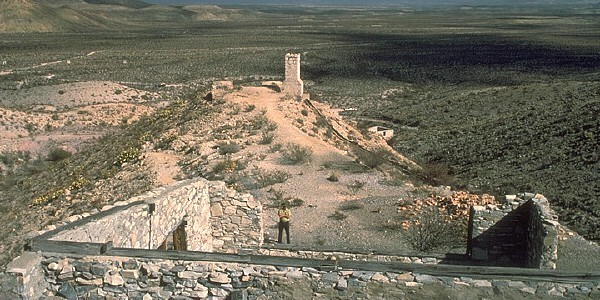 Below: View of ruins at Big Bend National Park. Courtesy National Park Service. What comes as somewhat surprising when you visit Big Bend National Park is the variety of scenes. From the dessert to mountain hilltops to the plains along the river, this large park covers the panoply of sites that are unique to the region. 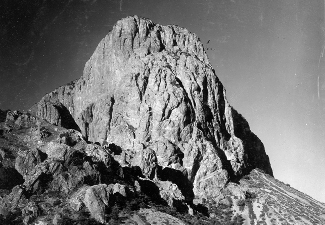 How high does it reach; try 5,400 feet at the Chisos Mountains Lodge or 7,832 feet at Emory Peak. How low? Along the Rio Grande River here you are at an elevation of 1,800 feet. Just drive along the park roads from east to west or north to south and note the difference. Or perhaps better still, park at one of the trailheads and hike. There are over one hundred and fifty miles of hiking trails in the park, ranging from the modest to the arduous. If you hike, know your limitations and bring plenty of appropriate supplies. For those wanting a more pedestrian adventure, stop in at one of the five Visitor Centers. There are exhibits, ranger talks, films, guided hikes, and more. For a charm that brings the past and present together, consider staying at the Chisos Mountains Lodge in the center of the park. It's not cheap, but it's cool. Not temperature necessarily, BTW. Beyond being a great place to hike, camp, and visit the history of the area, Big Bend National Park today has a variety of current concerns that you should be aware of. You can cross into Mexico from Wednesday to Sunday at the Boquillas Port of Entry and you will need a passport to do so. Being as the park shares a border with Mexico for one hundred and eighteen miles, the park is subject to illegal entry and care should be taken to keep valuables in a safe place, as well as to let park officials know of any suspicious activity. 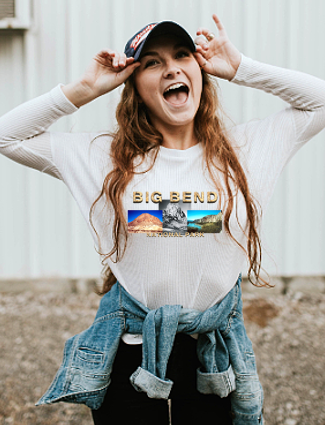 Big Bend National Park T-Shirts and Souvenirs from the official merchandise of America's Best History. Great for your next western vacation or planning session. 1. Want to stay in your car. Take the Chisos Basin Road Drive (6 miles). It takes you from the desert to the mountains and includes the lodge and restaurant, in case you want to stay or eat. This road was constructed in the 1930s by the Civilian Conservation Corp. It is not recommended for large vehicles. A second drive, longer than the first, is the Ross Maxwell Scenic Drive. It's 30 miles long and brings many of the most vibrant vistas of the park, and park history, to you as you travel, including the Sam Nail and Homer Wilson ranches. 2. Use your feet. Take in one of the guided ranger tours on a variety of topics from the CCC to a canyon. These occur all over the park and sometimes include night programs in a place where the sky is so pure, it just might make you giddy. Of course, you may be giddy when you get there already; each to his own. There are even private guided ranger hikes for $40 per hour; 4 hour minumum. The others are free. 3. Orient yourself to the park by taking in the 22 minute film at the Panther Junction Visitor Center. 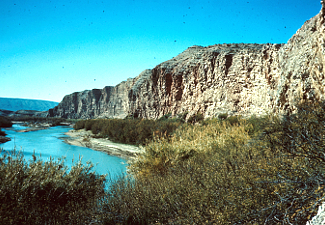 Photo above: Archive photo of Big Bend. Courtesy USGS. Panther Junction Visitor Center - Center of park. It has exhibits, a theatre with orientation movie, a book store, and ranger orientation. It is open all year. There is also a nature trail just outside. Chisos Basin Visitor Center - Center of park, south of Panther Junction. It also has exhibits about the park, a book store, rangers on duty, and is open year round. Castolon Visitor Center - Southwest section of park near Rio Grande River in La Harmonia building. Exhibits and bookstore. Not open in summer. Rio Grande Village Visitor Center - Southeast section of park near Rio Grande River. Exhibits, film, and bookstore. Not open in summer. Persimmon Gap Visitor Center - Located at the north entrance to the park. There are exhibits, a film, orientation, and a bookstore. Not open in summer. One hundred and fifty miles of hiking tails are spread throughout the park, with many backcountry campsites along them. They come in three distinct varieties; desert, mountain, and river. And if you like to ride your horse along these trails, the variety is spectacular. For those that like to float, you can take a trip down the Rio Grande River. Some of the sections are Class 4 rapids, so be experienced and prepared. Be aware that when you are on the Rio Grande River, you may be floating in Mexican waters at some times. While this is allowed at the present time, without a passport, you are not allowed to dock on the Mexican side of the border. This is considered illegal entry. Check for the current rules and regulations before you begin. Chisos Mountains Lodge is located in the center of the park and is the sole lodging available inside. It also has a gift shop and dining, plus seventy-two rooms. Rooms are in the $100 to $150 price range. 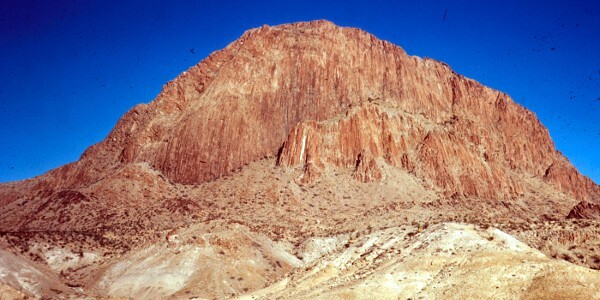 There are three developed campgrounds within Big Bend National Park and a large number of backcountry campsites (these require a backcountry permit). 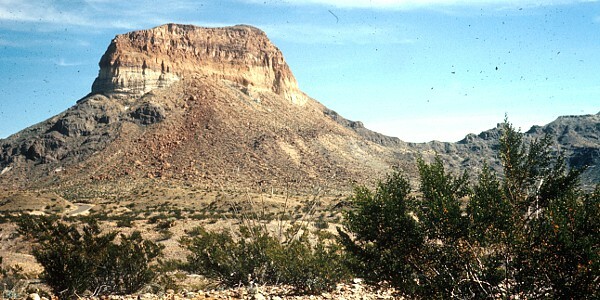 Chisos Basin Campsite is located in the central park area near the lodge. It has 60 campsites, some reservable, and is open year round. Large trailers and recration vehicles are not recommended here. Cottonwood Campsite is right on the Rio Grande River in the southwest area of the park. It is located near the Castalon Visitor Center, has 24 campsites, no hookups, and is also open year round. Rio Grande Campsite is also along the Rio Grande in the southeast section of the park. It has some shade, one hundred campsites, no hookups, and is also open year round. The Visitor Center there, as well as at Castalon, is only open for part of the year. For those more into the motels and bed and breakfasts route after your hike or visit, Terlingua and Study Butte have various lodging option closer to the park. Marathon, Texas has more, but is further away. Check out your favorite online lodging site such as Expedia for the lodging type of your choice. Coming from the United States, there are three main routes to the park. From Presidio, head east for 95 miles on Route 170 to the west entrance of Big Bend National Park. From Alpine, it's 103 miles south on Route 118, also to the west entrance. There is not visitor center at the west entrance station. The main visitor center to the park is located about 30 miles inside the west entrance at Panther Junction. From Marathon, you'll be heading south on Route 385 to the north entrance of the park, 69 miles away. The Persimmon Gap Visitor Center is just inside the north border. Photo above: Nature photo from the history of the park. Courtesy United States Geological Service.